Declining consumer confidence is starting to affect the way Australian businesses market to consumers, with PMP saying fear over the global economy is the main reason 40% of Australian businesses are looking to spend more on their social media presence. Richard Allely, chief executive officer, PMP Limited, says tougher economic conditions are placing increased pressure on Australian businesses to get their marketing strategies aligned. “Australian companies are starting to realise that it is now more important than ever to deliver successful marketing initiatives, as consumers look to cut back on spending during the global economic downturn. “Businesses can see there is value for money in using online and social media channels to engage with consumers, with advertising spend on digital media channels expected to grow to around 15% in the next couple of years,” says Mr Allely. While many companies may be tempted to cut back on their marketing initiatives, Mr Allely says this could lead to a decrease in visibility with businesses running the risk of becoming out of favour in an ever-growing marketplace. “There are so many new and cost effective channels now available to businesses looking to communicate with their customers and the 2012 Schmart Marketing Conference aims to help organisations explore how social media and online ‘tools’ combined with customer insights and traditional media can be used to successfully engage their customers. “Using the correct channels in a collaborative way can ensure businesses not only survive the downturn, but are able to emerge on the front foot once more stable conditions return,” says Mr Allely. As one of Australia’s largest marketing communications providers, PMP recognise the need to assist businesses to best utilise traditional and digital outlets to effectively deliver messages. 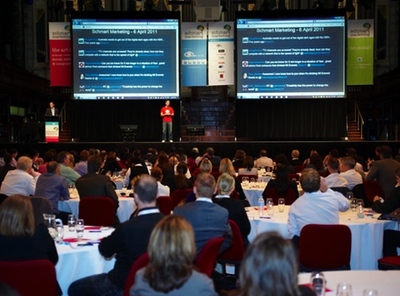 The 2012 Schmart Marketing Conference, which takes place in Melbourne on 21 February and in Sydney on 23 February, will bring international and national experts in the marketing field to provide best practice on how to connect with their customers. Global marketing and business expert Jeffrey Hayzlett and UnMarketing’s Scott Stratten will present at the conference, providing insight and tips on how to make the most of the changing marketing landscape. Marketing subscribers, buy 2 tickets to the 2012 Schmart Marketing Conference, and we’ll give you the second ticket at 50% off. Simply enter promotional code marketing@smc12 when you register. Offer valid till 17 February 2012. Not valid with any other offer.